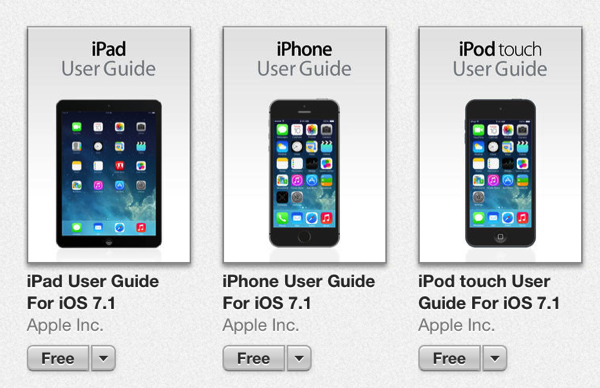 As pointed out by RazorianFly, Apple has updated its iOS 7 user guides with new features that are included in iOS 7.1. Apple’s digital iOS guides can be downloaded for free in the iBookstore, and are available for iPhone, iPod touch and iPad, providing a definitive guide for getting the most out of your iOS devices. Apple originally designed the guides to walk users through all the aspects of its revamped iOS 7 operating system, allowing them to learn about some of its new features and how they work. Just like other iBooks, these guides are available for download on Mac and iOS devices with iBooks installed, as well as with iTunes on a computer.